At the invitation of Israeli Prime Minister Benjamin Netanyahu, the government of Palestine, Egyptian Prime Minister Mostafa Madbouly and the government of the United Arab Emirates, Vice President Wang Qishan will visit Israel, Palestine, Egypt and the United Arab Emirates from October 22 to 30 and co-chair the fourth meeting of China-Israel Joint Committee on Innovation Cooperation with Israeli Prime Minister Benjamin Netanyahu in Israel. Q: According to Australian media reports, Prime Minister Scott Morrison recently visited the Chinese community in Sydney and greeted them with a "ni hao". He said that his government values the contributions of the Chinese community and Australia welcomes Chinese students, investors and tourists. Australia and China need to constructively manage differences and a strong bilateral relationship serves the interests of both sides. What's your comment? A: The Chinese side noted Prime Minister Scott Morrison's positive remarks on China-Australia relations. The sound and steady development of the China-Australia relationship serves the common interests of the two peoples. We hope the Australian side will work with the Chinese side to move forward our bilateral relations along the right track on the basis of mutual respect and treating each other as equals. Q: We noted that Premier Li Keqiang is visiting Belgium. Do you have more details about the outcomes of this visit? A: As you have noted, Premier Li Keqiang paid a working visit to Belgium yersterday. He had in-depth talks and jointly met the press with Belgian Prime Minister Charles Michel. The two leaders also witnessed the signing of a host of bilateral cooperation documents covering many areas. The two leaders reached a series of consensus during the visit. Politically, the two sides agreed to maintain high-level interactions, conduct timely communications and exchanges on issues of mutual interest and continuously consolidate and enhance mutual political trust. Economically, the two sides agreed to further expand two-way opening-up and enhance bilateral trade and investments. Prime Minister Charles Michel also clearly said that the Belgian side is willing to synergize the EU's connectivity strategy with China's Belt and Road Initiative and support the Belgian businesses' investment in China. The two sides will continue to commit themselves to the steady and sound development of China-EU relations and accelerate the Bilateral Investment Treaty (BIT) negotiations. In terms of international affairs, the two sides agreed to strengthen communication and coordination under multilateral frameworks including the United Nations, uphold multilateralism and rules-based international order, maintain free trade system and an open world economy, and make contributions to world peace, stability and development. Q: The US Treasury Department didn't list China as a "currency manipulator" in a twice-yearly report on foreign exchange policies released on October 17. Meanwhile, the report also noted that the US will closely monitor China's currency practices. What's your comment? A: We have noted relevant reports. The conclusion that China doesn't manipulate its exchange rate in this report stands in line with common sense and the consensus of the international community. 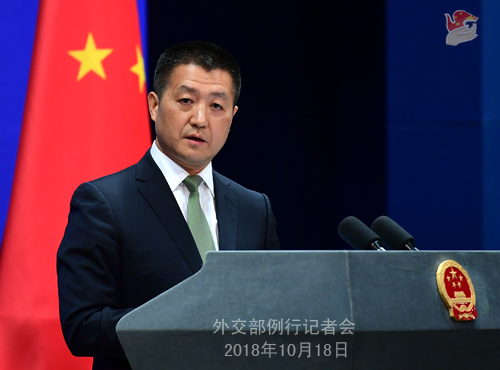 As a responsible major country, China has been reiterating that it will neither engage in competitive devaluation nor use the RMB exchange rate as a tool to address trade disputes and other external disruptions. 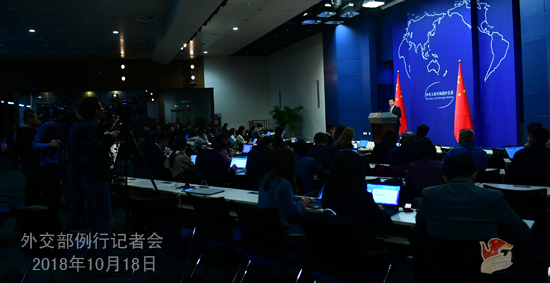 Going forward, China will steadfastly deepen the market-oriented reform of exchange rate, continue to improve the managed floating exchange rate system based on supply and demand in the market with reference to a basket of currencies, and keep the RMB basically stable at an adaptive and equilibrium level. Meanwhile, we also hope the US could respect market rules and objective facts and refrain from politicizing the exchange rate issue. Q: US Defense Secretary James Mattis is said to meet Chinese Minister of Defense Wei Fenghe in Singapore today. Can you confirm that and do you have any details about the meeting? A: China and the US maintain communications and dialogues in various areas. You may refer to the Ministry of Defense for more specifics. Q: Two US B-52 bombers reportedly performed a training mission in the South China Sea recently. What's your comment? A: I have noted relevant reports and we are still checking on the situation. 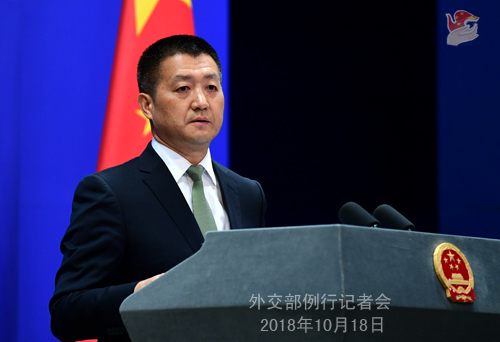 I would like to reiterate that the Chinese side always respects and upholds the freedom of navigation and overflight enjoyed by other countries under international law, and firmly opposes the relevant country using the pretext of "freedom of navigation and overflight" to undermine the sovereignty and security interests of littoral countries and disrupt regional peace and stability. We will take necessary measures to safeguard our sovereignty and security interests. Q: Do you have any comment on the US leaving the Universal Postal Union? It is widely seen as another move targeting China by the Trump administration. A: First of all, I want to say that the US side has recently withdrawn from more than one organization. It has its own consideraions behind these choices, but it is not necessary to involve China. We express regret over the US decision to withdraw from the Universal Postal Union (UPU). The UPU is a UN specialized agency responsible for the international postal affairs. It plays a positive role in strengthening the links between countries and promoting trade facilitation. China is committed to upholding multilateralism and plays an active role in supporting the work of the UPU. We will continue to work with all relevant parties to contribute to the development of the international postal cause. Q: There have been growing attention to Chinese political influence overseas recently. This time is in New Zealand where the opposition leader is under fire for hiding donations from a Chinese businessman who reportedly has links with the Chinese government. Do you have any comment on this businessman and his reported links with the Chinese government or the broader issue of China's political influence overseas? A: I'm not aware of the specific case and would like to check on that later. In principle, as we have said many times, China has no intention and has never intended to interfere in the internal affairs of other countries. A basic principle of China's diplomacy is adherence to the Five Principles of Peaceful Coexistence, one of whose core contents is mutual respect for sovereignty and non-interference in the internal affairs of other countries. Recently, we have heard such allegations in different variations. In fact, we would like to encourage each and every country to make a clear and open commitment to the world that it will not interfere in the internal affairs of others under any excuse and in any way. Q: Sri Lanka has reversed a decision to award a housing development project worth $300 million to China, and has given it to an Indian company. Does China see this as a politically motivated decision made by the Sri Lankan government? A: You said that this decision was "politically motivated". I wonder whether this is your conclusion and speculation or a statement made by the Sri Lankan government? We have said many times that the mutually beneficial cooperation between China and other countries, including Sri Lanka, is conducted on the basis of equal-footed consultations and under the principle of extensive consultation, joint contribution and shared benefits. Yesterday, I talked about some positive comments made by the Sri Lankan government official on China-Sri Lanka cooperation. We hope that the relevant parties can view the cooperation between the two sides in a correct and objective way. Meanwhile, I want to stress that we always follow the principle of transparency and openness in our cooperation with Sri Lanka and other countries. We also encourage all other countries to carry out mutually beneficial cooperation so as to jointly promote regional peace, prosperity and development. Q: China and the Global Initiative to Combat Nuclear Terrorism (GICNT) are holding the Workshop on Combating Nuclear Terrorism and Nuclear Emergency Response at Major Public Events in Beijing. Could you give us more details? A: China and the GICNT are holding the Workshop on Combating Nuclear Terrorism and Nuclear Emergency Response at Major Public Events in Beijing from October 16 to 19. Representatives from over 20 countries and international organizations including the United States, Russia, the United Kingdom, France and the International Atomic Energy Agency had an in-depth exchange of views on combating nuclear terrorism and nuclear emergency response at major public events. This is another concrete measure taken by the Chinese side to implement the outcomes of the Nuclear Security Summit. China always attaches great importance to nuclear security and commits itself to promoting the international cooperation on nuclear security. Guided by the five-point proposal put forward by President Xi Jinping at the 2016 Nuclear Security Summit in Washington D.C., we will continue to step up exchanges and cooperation with relevant countries, provide more public goods to the international community and contribute to enhancing global nuclear security and addressing the threat posed by nuclear terrorism.